Filtered Terminal Blocks - Corry Micronics, Inc.
CMI offers a series of filtered terminal blocks for use in filtering power supplies, industrial controls, and instrumentation information. These terminal blocks feature “C” and “Pi” circuit types, capacitance values up to 30,000 pF, a flammability rating of UL94 V-0, and voltage ratings up to 300 VDC, 240 VAC. 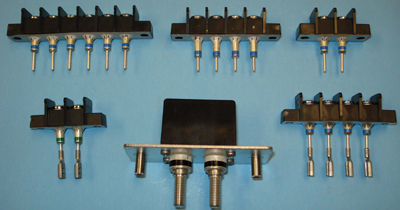 The filtered terminal blocks are built with a barrier type design, and have the options for panel or chassis mounting. Additional options include custom wiring, 2-8 filtered pins, and a choice of straight pin, female/male quick disconnect, or solder spade lug terminals. These filters are also UL and CSA recognized (UL File E357495, UL 1059/CSA C22.2 No. 158). For more information on the CMI filtered terminal blocks, download the datasheets.